« 236 - What is Data Quality? There was a news report early on the week about the effect of loss of the sense of smell upon mice, particularly whether they became fat. Immediately, there were speculations not represented a s such saying that, in order to become thinner, one might block one’s nose. I look here to see what related articles there are. And, probably, put my own spin on the consequences. The original report is, I think, this one . Olfactory inputs help coordinate food appreciation and selection, but their role in systemic physiology and energy balance is poorly understood. Here we demonstrate that mice upon conditional ablation of mature olfactory sensory neurons (OSNs) are resistant to diet-induced obesity accompanied by increased thermogenesis in brown and inguinal fat depots. Acute loss of smell perception after obesity onset not only abrogated further weight gain but also improved fat mass and insulin resistance. Reduced olfactory input stimulates sympathetic nerve activity, resulting in activation of β-adrenergic receptors on white and brown adipocytes to promote lipolysis. Conversely, conditional ablation of the IGF1 receptor in OSNs enhances olfactory performance in mice and leads to increased adiposity and insulin resistance. These findings unravel a new bidirectional function for the olfactory system in controlling energy homeostasis in response to sensory and hormonal signals. However, this paper  seems to say something quite different. Conclusion. This study suggests high BMI is associated with olfactory dysfunction. Prospective clinical research should examine this further to determine if increasing BMI may be a risk factor in olfactory loss and to elucidate what role olfactory loss may play in diet and feeding habits of obese patients. Paper  starts with some scary stuff confirming content I have written on before; even though it is relating to US population, the scale is relevant. The epidemic of obesity has been well described, with close to 65% of the adult population categorised as overweight or obese, showing an increase of 48% and 134%, respectively, since the early 1980s. At this time approximately 1 in 20 Americans have a Body Mass Index (BMI) >40 kg/m2 . Obesity has been shown to cause a variety of diseases, is linked to almost 300,000 deaths each year, and is responsible for $117 billion in direct and indirect costs annually in the United States . hyposmia, a reduced state nosing. I suspect anosmia has often been used for partial loss—certainly by me—when it should be used for total loss. Anosmia is equivalent to blindness while hyposmia is equivalent to needing glasses. Anosmia need not be permanent and like eyes, might apply to only one nostril. Olfactory dysfunction also affects a significant portion of the population, with 5% of the general population being anosmic and 15% considered to be hyposmic [3, 4]. The prevalence of smell dysfunction increases with age, with hyposmia being identified in approximately 20 to 25% of patients over the age of 50 [1, 5–7]. Multiple studies have shown that odour acquires the ability to modify both preparatory and satiety-related components of ingestion, and thus olfaction may play a large role in the development of obesity and the resistance we see in these patients to weight loss methodologies . Animal models indicate that fasting increases and satiation decreases olfactory detection , and recently it was shown that the peptide hormone adiponectin, considered to be a starvation signal, increases the responsiveness of the olfactory system . A decade ago, it was shown that morbidly obese individuals (BMI > 45) were more likely to show olfactory dysfunction than moderately obese individuals , but it has never been shown if olfactory function is related to BMI in any other group. The purpose of our study was to compare BMI in a group of patients with subjective olfactory complaints with the BMI of patients without subjective olfactory complaints. The research that I have looked at appears to conflict, then. When very hungry our noses become more effective , but it might be reversed, that very sensitive noses make us think we are hungry. The conclusion of  is that High BMI appears to be associated with olfactory dysfunction. That is not the same as , which says rather the reverse, that loss of the sense of smell has a rather different effect. I wonder if these are similar populations. Wider discussion (thanks, Pete²) points out that we don’t know very much about the populations for  and . it is perfectly possible that neither is wrong and more than possible that our interpretation of what hey say is at fault. Looking for ways in which they may both be true (trusting the academics to report correctly but not for brief overviews to give precise understanding), I suggest that perhaps the populations are not even similar. Also, I wonder if the order of olfaction loss and over-eating matters. There is some evidence that we smell the food and this tells us to stop eating. Afferent inhibition, indeed. See Sensa Sprinkles and . I found the idea suspect. Source  finds a connection between high fat foods and an increase in anosmia. Suggestion then that a ‘bad diet’ causes you to lose your sense of smell. Doesn’t that conflict with ? Actually, when I looked a lot closer, I didn’t think that was what the research said at all, only that there is a connection made between the sense of smell and the processing of fat; for which the relationship (A=>B or A<=B or A<=>B) was as yet unclear. So is there a problem with who it is that reads and reports the research rather than who it is does it? Correlation is not causation. Essay 232. Source , which was the NYTimes echoing the Sun (such a reliable source), does attempt to understand what is reported and the NYT has had the sense to clearly ring round and ask sensible questions of those who ought to understand what has actually been discovered. • the sense of smell has some control over how you store fat. • when a mouse (or a human) is hungry, it is more sensitive to the sense of smell. The rats in  that were on a high-fat diet and had no sense of smell were 16% lighter than those with the sense of smell. Those on an ordinary ‘regular’ diet also weighed less than their ‘nosmic’, nose-empowered equivalents, but the difference was too small to be called significant. 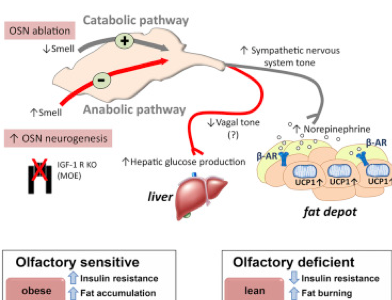 Impaired olfaction affects the types of fat storage and this is perhaps the crucial point. The mice without a sense of smell were burning calories (brown fat¹). Further, the white fat ¹ we declare to be ‘bad’ behaved more like brown fat. The significant part of the research in  was the consequence, a sort of ‘it can’t be that easy’ sort of reaction worthy of a factumentary. By engineering some rodents to have an even stronger sense of smell, These super-smellers became obese, but not because they consumed more food than usual. So let us for the nonce accept that it appears that if we extend the concept to humans we may be able to do something about obesity by attending to our sense of smell. Let us imagine we can do that in a non-permanent way. It looks as though we can turn ‘on’ the fat-burning mechanisms I have noticed being referenced in several sites encouraging exercise. While the mass population is uninterested in having to work for results, this then has huge potential for several industries. I will see if I can garner a response from the extended family before extending that last idea. 1 http://www.cell.com/cell-metabolism/pdfExtended/S1550-4131(17)30357-1 the original paper? 2 http://scienceblogs.com/cortex/2009/06/19/smell-and-obesity/ the commentary afterward is rewarding, though at first it seems that the article is exactly backwards compared to the others..
12 http://www.slate.com/articles/health_and_science/medical_examiner/2008/07/the_nose_that_never_knows.html Unimpressive, but it provides a little balance. 13 https://www.eurekalert.org/pub_releases/2017-07/cp-mla062917.php Says much the same, but a little different. 16. Richardson B. E., Vander Woude E. A., Sudan R., Thompson J. S., Leopold D. A. Altered olfactory acuity in the morbidly obese. Obesity Surgery. 2004;14(7):967–969. doi: 10.1381/0960892041719617. This does NOT say that thin people have no sense of smell. It does NOT say that people who lose their sense of smell automatically become thin. I found evidence that people who lose their sense of smell can become anorexic, but that does not mean that all such folk do. the food industry, perhaps particular parts of it unevenly. Potential also for temporary effects being used to advantage. One can see dangers galore in having many people with no sense of smell, but perhaps not if that were a temporary state; it could be a superb way of controlling obesity. I am sure that many people will see it is a way to stuff themselves silly and not put on weight, and I can see many food suppliers rubbing their hands with glee. That doesn’t do anything good for us as a planet or a species. I see possible benefit if we can cause our bodies to read one state as another, causing us to burn fat instead of store it. Better still if we can do this in some deliberate and deliberated fashion. brown fat is specialised to produce heat through metabolism . It burns fatty acids to produce heat . beige fat cells: the subcutaneous fat storage cells that accumulate around our thighs and midriffs . 2 P: Interesting stuff. That to smell or not smell our food might change our metabolism is quite remarkable. There are specific and general issues raised, as you rightly identify. So paper 1 & 7 together suggest that if obesity reduces olfaction, this could start to encourage weight loss through modifying the storage and use of fat, but paper 7 suggests far more anosmic patients are obese than not. DJS: I was bothered by that. Am bothered. Wondered if the way in which smell was lost was significant, or if the order was. i.e. if anosmia occurs AFTER obesity, it may be irrelevant, so the count is two populations, not one. P: What we don’t see is the population of body masses in paper 7. We are only looking at the broad categories of obese, overweight and healthy. Given that paper 1 shows only a 16% difference in body mass between groups, this could easily be absorbed by the BMI categories. 16% mass change is around 4 BMI points. The Overweight zone is 5 points wide and obese is just anything over a BMI of 30. DJS: Quite. So, as ever, the headline points to causation when we may be seeing correlation only. A 16% change is significant, given the state of our collective health, but does not point to a collective ‘fix’. P: What we would really like to see in paper 7, to make it comparable to paper 1 is a comparison of masses between those who are obese with olfaction and those without. If the mean mass of the two obese groups different by 16% or similar, then we might have something. Unfortunately, given that the humans in paper 7 have vastly different lifestyles etc, for the comparison to be meaningful it would have to be done with a much, much larger population. DJS: You are right. I will move that point into my essay. P: All of which brings us to the general point you make, that research papers are highly specific, highly nuanced reports. Drawing generalisations, headlines and soundbites from research requires a high level of skill, time and understanding, usually missing from most media outlets. Issues of causation, assumptions of linearity or symmetrical behaviour, and complex, overlapping and competing pathways make it very hard to say anything without resort to detail, qualifiers or uncertainty. To conduct the study, molecular biologist Andrew Dillin of the University of California, Berkeley, and colleagues turned to a variety of genetically altered mice. The scientists gave them regular doses of the diphtheria toxin—which causes a temporary loss of odour-sensing neurons—to suppress their sense of smell. They then fed the rodents either a normal diet or fatty foods—the mouse equivalent of cheesecake and pizza—that usually induce obesity. After more than 3 months of noshing on regular chow, the odour-deprived rodents weighed slightly less than mice whose sense of smell was intact. In the group on the high-fat diet, however, the mice that couldn’t smell weighed 16% less than animals that could, which became obese. Losing the ability to smell also caused a different group of already-obese mice to lose weight, the researchers reveal today in Cell Metabolism. Dillin and his colleagues next asked what happened if the animals’ sense of smell were sharper. The researchers followed weight changes in a different group of genetically engineered rodents that are hypersensitive to odours. These super-smellers became obese, but not because they consumed more food than usual. That result supports the idea that the sense of smell modifies how much energy the animals use. “There’s more to gaining weight than just eating food—it’s how you are perceiving the food,” Dillin says. This is the article from science daily, : I have reformatted it, since I do dislike that each sentence is printed as a paragraph. Dumbing down. Our sense of smell is key to the enjoyment of food, so it may be no surprise that in experiments at the University of California, Berkeley, obese mice who lost their sense of smell also lost weight. What's weird, however, is that these slimmed-down but smell-deficient mice ate the same amount of fatty food as mice that retained their sense of smell and ballooned to twice their normal weight. In addition, mice with a boosted sense of smell -- super-smellers -- got even fatter on a high-fat diet than did mice with normal smell. The findings suggest that the odor of what we eat may play an important role in how the body deals with calories. If you can't smell your food, you may burn it rather than store it. These results point to a key connection between the olfactory or smell system and regions of the brain that regulate metabolism, in particular the hypothalamus, though the neural circuits are still unknown. Humans who lose their sense of smell because of age, injury or diseases such as Parkinson's often become anorexic, but the cause has been unclear because loss of pleasure in eating also leads to depression, which itself can cause loss of appetite. The new study, published this week in the journal Cell Metabolism, implies that the loss of smell itself plays a role, and suggests possible interventions for those who have lost their smell as well as those having trouble losing weight. The researchers used gene therapy to destroy olfactory neurons in the noses of adult mice but spare stem cells, so that the animals lost their sense of smell only temporarily -- for about three weeks -- before the olfactory neurons regrew. The smell-deficient mice rapidly burned calories by up-regulating their sympathetic nervous system, which is known to increase fat burning. The mice turned their beige fat cells -- the subcutaneous fat storage cells that accumulate around our thighs and midriffs -- into brown fat cells, which burn fatty acids to produce heat. Some turned almost all of their beige fat into brown fat, becoming lean, mean burning machines. In these mice, white fat cells -- the storage cells that cluster around our internal organs and are associated with poor health outcomes -- also shrank in size. The obese mice, which had also developed glucose intolerance -- a condition that leads to diabetes -- not only lost weight on a high-fat diet, but regained normal glucose tolerance. On the negative side, the loss of smell was accompanied by a large increase in levels of the hormone noradrenaline, which is a stress response tied to the sympathetic nervous system. In humans, such a sustained rise in this hormone could lead to a heart attack. Though it would be a drastic step to eliminate smell in humans wanting to lose weight, Dillin noted, it might be a viable alternative for the morbidly obese contemplating stomach stapling or bariatric surgery, even with the increased noradrenaline. Dillin and Riera developed two different techniques to temporarily block the sense of smell in adult mice. In one, they genetically engineered mice to express a diphtheria receptor in their olfactory neurons, which reach from the nose's odor receptors to the olfactory center in the brain. When diphtheria toxin was sprayed into their nose, the neurons died, rendering the mice smell-deficient until the stem cells regenerated them. Separately, they also engineered a benign virus to carry the receptor into olfactory cells only via inhalation. Diphtheria toxin again knocked out their sense of smell for about three weeks. In both cases, the smell-deficient mice ate as much of the high-fat food as did the mice that could still smell. But while the smell-deficient mice gained at most 10 percent more weight, going from 25-30 grams to 33 grams, the normal mice gained about 100 percent of their normal weight, ballooning up to 60 grams. For the former, insulin sensitivity and response to glucose -- both of which are disrupted in metabolic disorders like obesity -- remained normal. Mice that were already obese lost weight after their smell was knocked out, slimming down to the size of normal mice while still eating a high-fat diet. These mice lost only fat weight, with no effect on muscle, organ or bone mass. The UC Berkeley researchers then teamed up with colleagues in Germany who have a strain of mice that are supersmellers, with more acute olfactory nerves, and discovered that they gained more weight on a standard diet than did normal mice.